A weighted average is one that takes into account the importance, or weight, of each value. 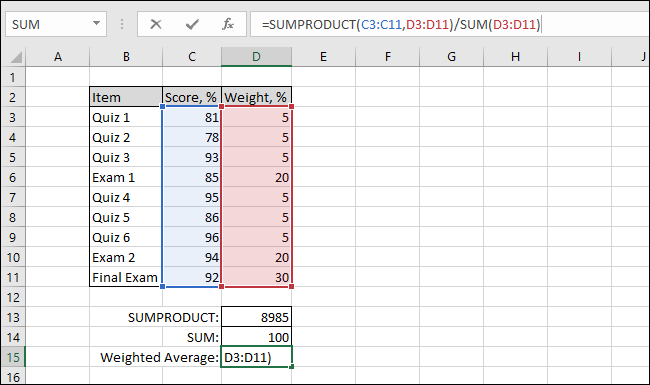 This article will show you how to use Excel’s SUMPRODUCT and SUM functions individually and how to combine the two to calculate a weighted average. A weighted average is an average that takes into account the importance, or weight, of each value. A good example would be calculating a student’s final grade based on their performance on a variety of different assignments and tests. Individual assignments usually don’t count as much towards a final grade as the final exam—things like quizzes, tests, and final exams will all have different weights. The weighted average is calculated as the sum of all of the values multiplied by their weights divided by the sum of all of the weights. 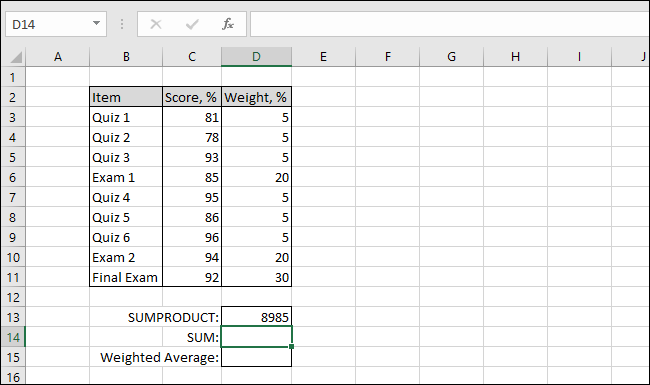 The following example will demonstrate how to use Excel’s SUMPRODUCT and SUM functions to calculate a weighted average. For our example, let’s look at a student’s quiz and exam scores. There are six quizzes each worth 5% of the total grade, two exams each worth 20% of the total grade, and one final exam worth 30% of the total grade. The student’s final grade will be a weighted average, and we will use the SUMPRODUCT and SUM functions to calculate it. 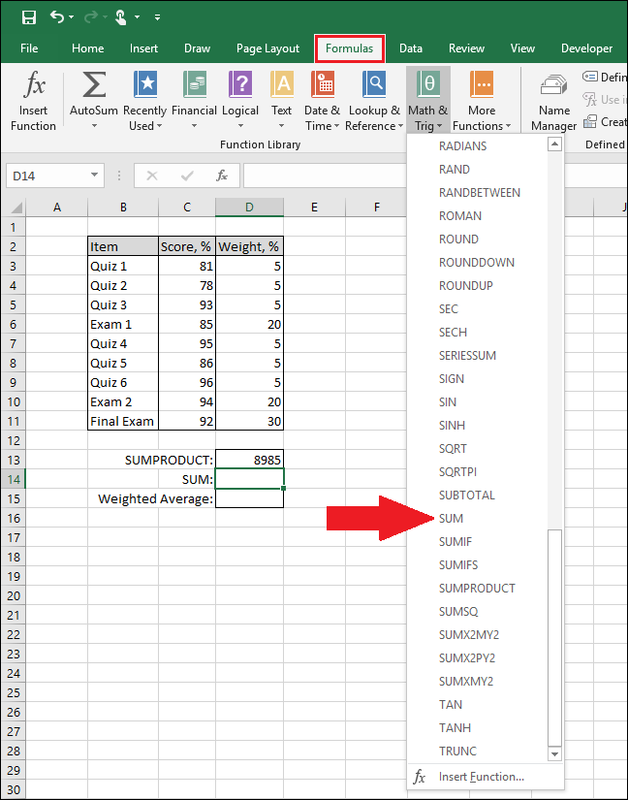 As you can see in our table below, we’ve already assigned the relative weights to each quiz and exam in the D column. First, let’s look at how the SUMPRODUCT function works. 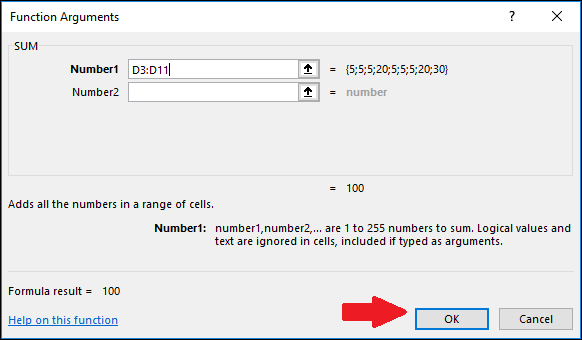 Start by selecting the cell where you want the result to appear (in our example, that’s cell D13). 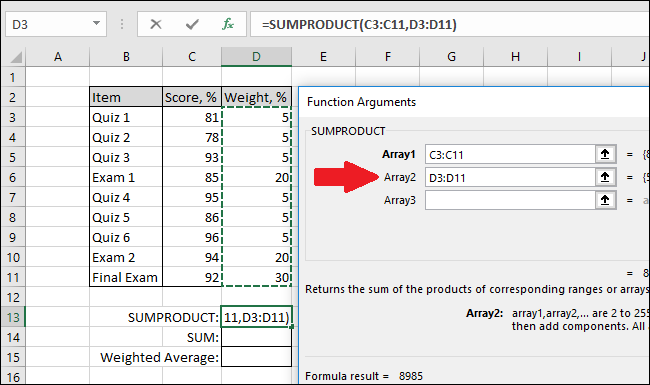 Next, navigate to the “Formulas” menu, select the “Math & Trig” drop-down, scroll to the bottom, and click on the “SUMPRODUCT” function. The “Function Arguments” window will appear. 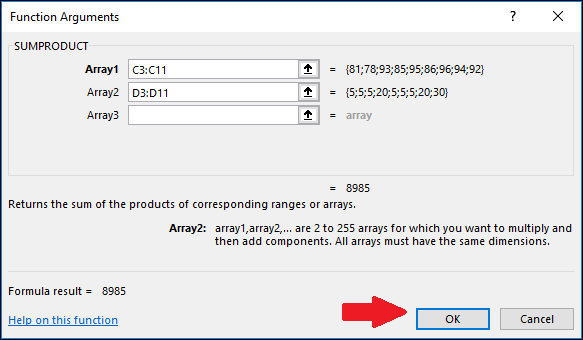 For the “Array1” box, select the student’s scores. Here, we’re selecting all the cells with actual scores in the C column. 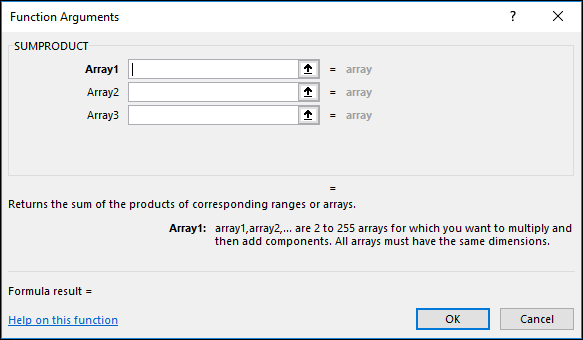 Next, use the “Array2” box to select the weights of the quizzes and exams. For us, those are in the D column. Click “OK” when you’re done. 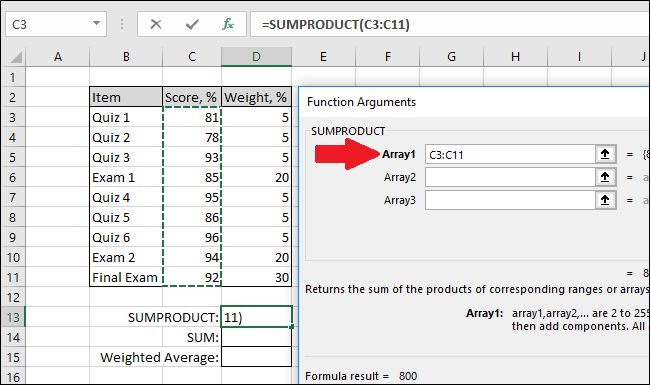 The SUMPRODUCT function will multiply each score by its corresponding weight and then return the sum of all of those products. Now let’s look at how the SUM function works. 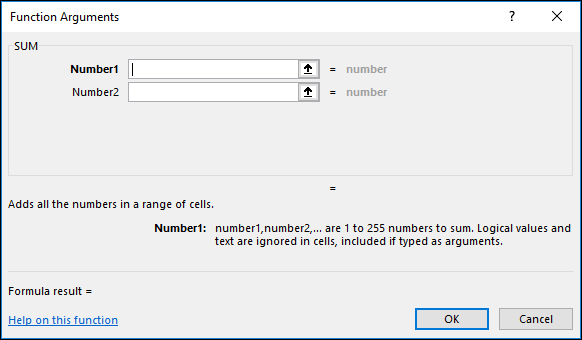 Select the cell where you want the results to appear (in our example, that’s cell D14). Next, navigate to the “Formulas” menu, select the “Math & Trig” drop-down, scroll to the bottom, and click on the “SUM” function. For the “Number1” box, select all of the weights. The SUM function will add all of the values together. 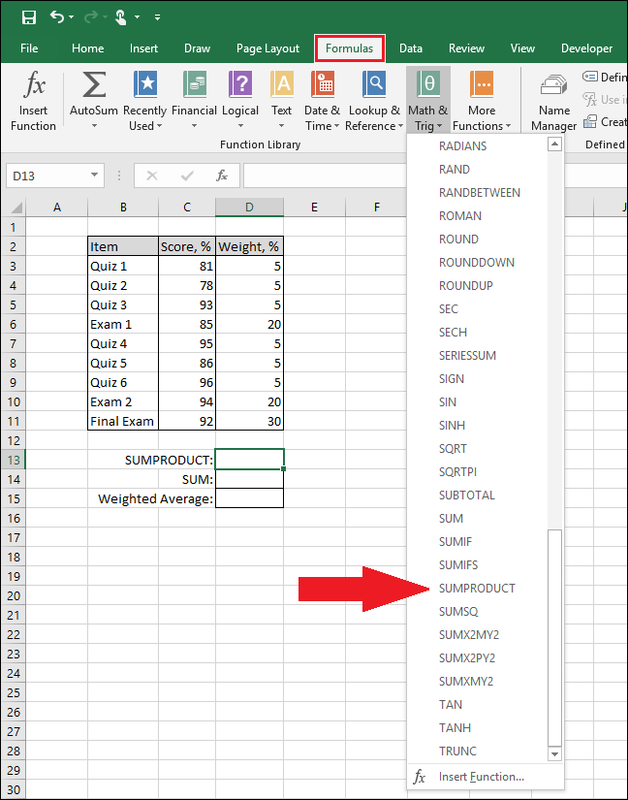 Now we can combine the two functions to determine the student’s final grade based on their scores and the weights of each score. 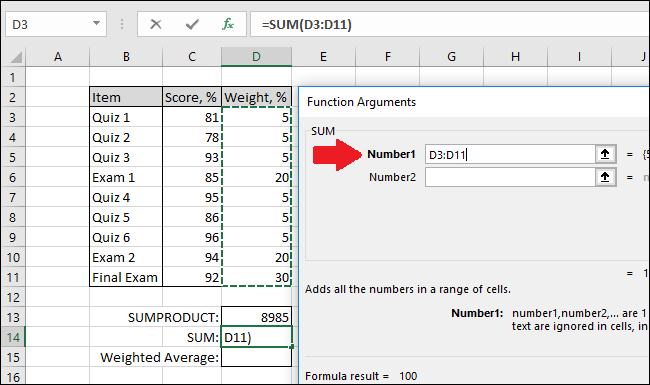 Select the cell where the weighted average should go (for us that’s cell D15) and then type the following formula into the function bar. Press “Enter” after typing the formula to view the weighted average. And there you have it. It’s a fairly simple example, but it’s a good one for showing how weighted averages work.